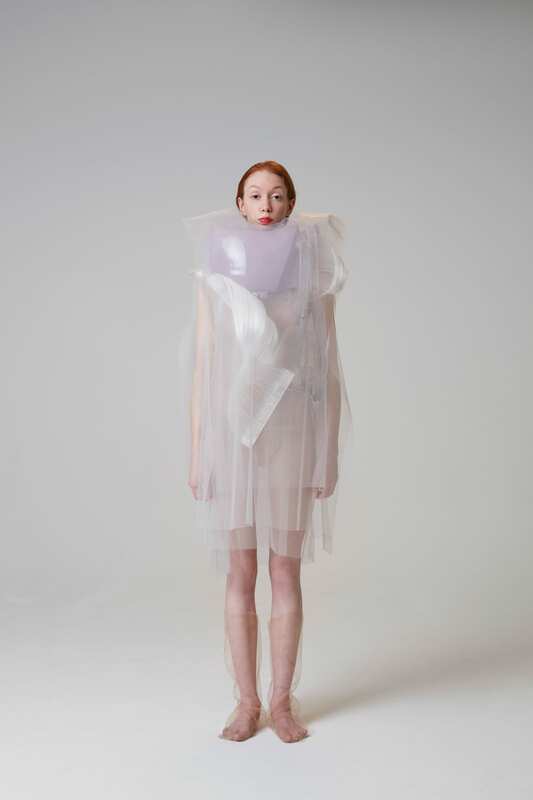 Ying Gao “explores both the status of the individual, whose physical contours are transformed by external interferences and the garment’s function as a fragile protective space. 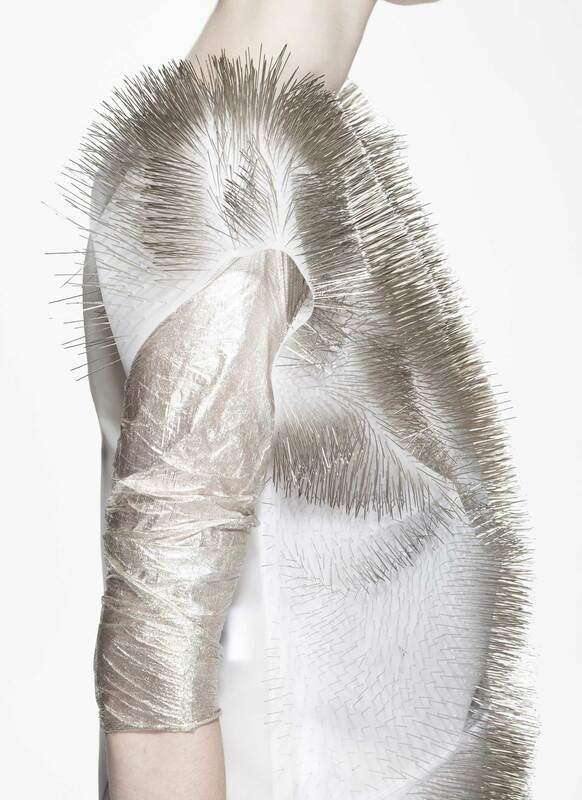 Her work testifies to the profound mutation of the world in which we live and carries with it a radical critical dimension that transcends technological experimentation.” The following projects use remarkably beautiful materials and technology to create a series of garments that absolutely bend the mind and question our daily interactions. 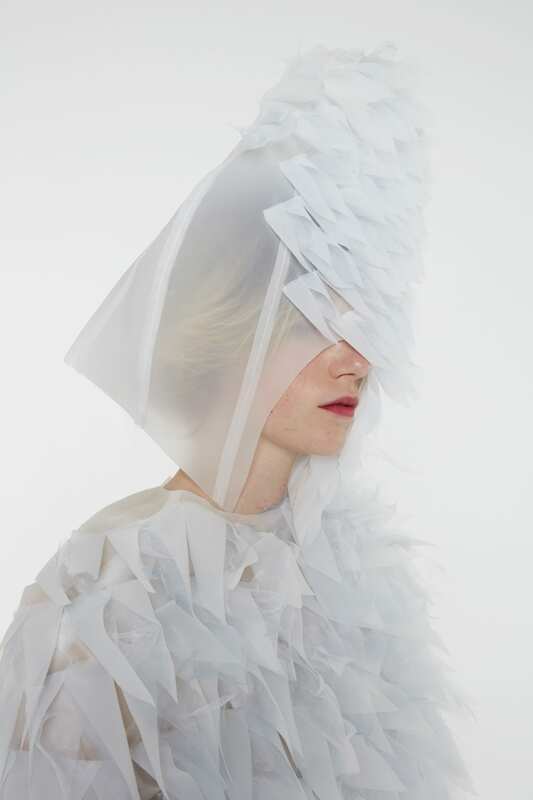 Possible Tomorrows explores the notion that clothing can be a protective barrier and a means of deflecting unknown and unwanted behaviours. 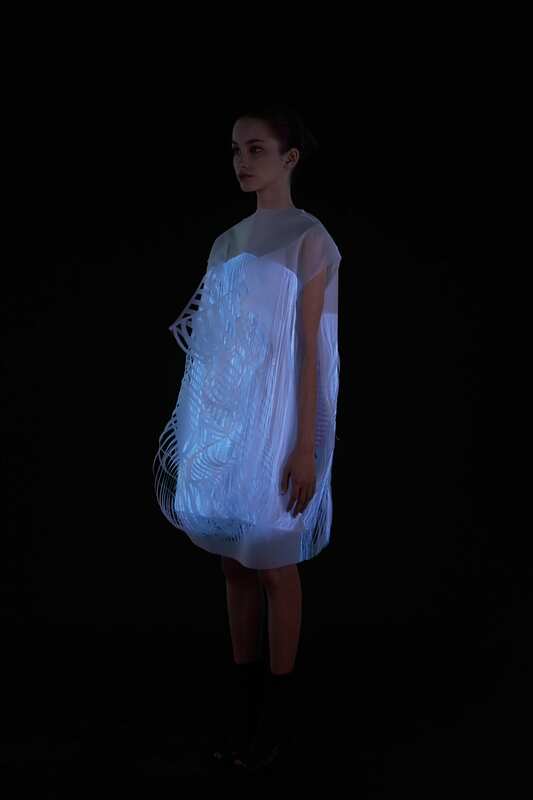 The two interactive dresses are made from white nylon mesh and thread, PVDF thread, thermoplastic and fitted with electronic devices. 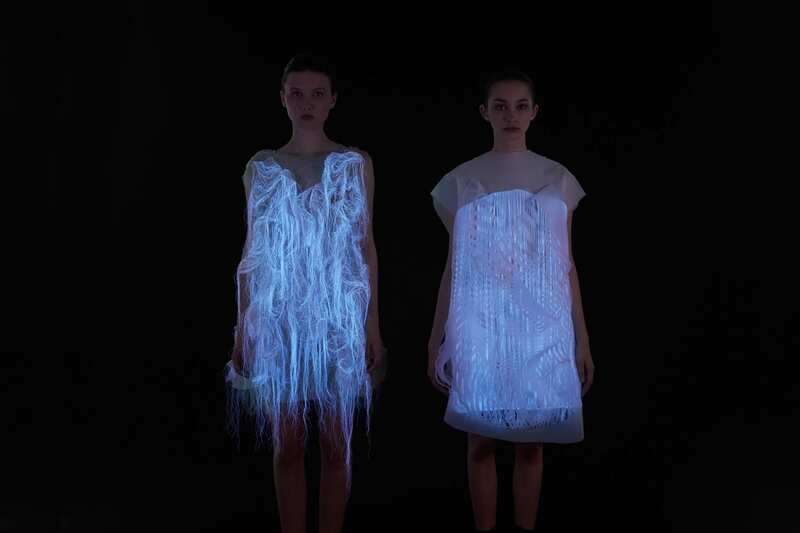 The movements of the dresses are triggered by a fingerprint scanner within a wooden frame that sits around the wearer’s neck. 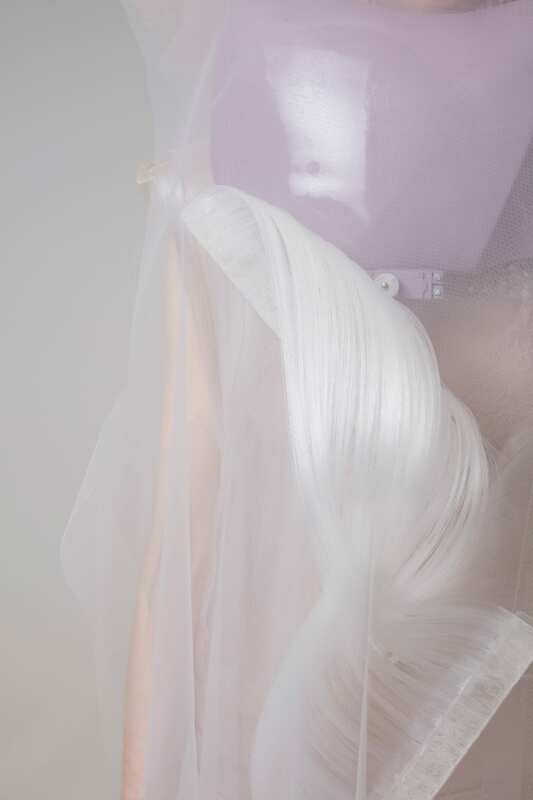 In the presence of strangers, whose fingerprints are not yet registered by the software; the delicate garments sway, shift and flow in the most mesmerising way. 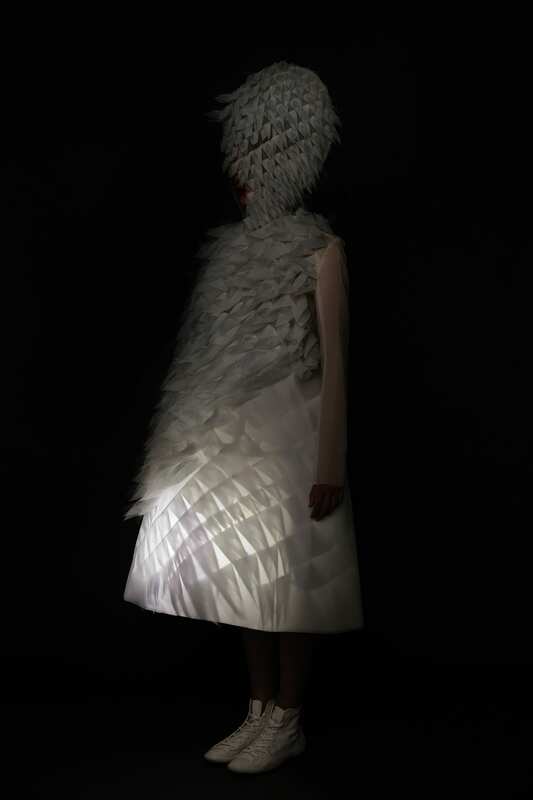 Instead of forming a defensive shield, the dresses become stimulated and are totally captivating when presented with the unknown. 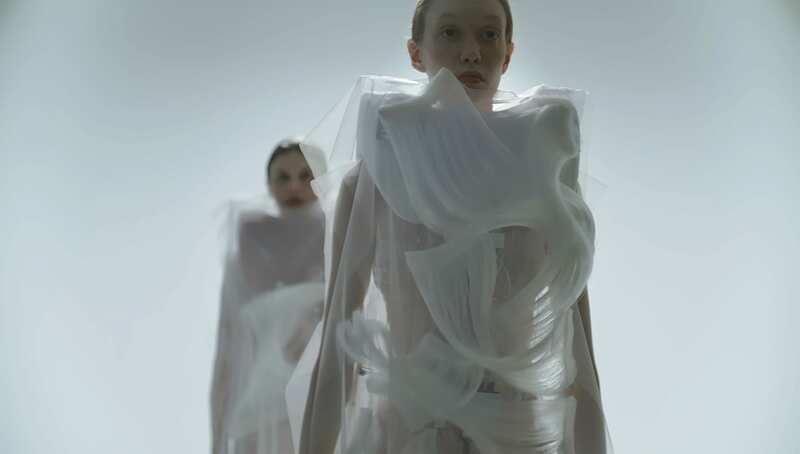 “The purpose of the project is to subvert the logic of security so that garments become anti-security objects,” says Gao. “The logic of security has become a political technology that too often prevents us from emancipating. 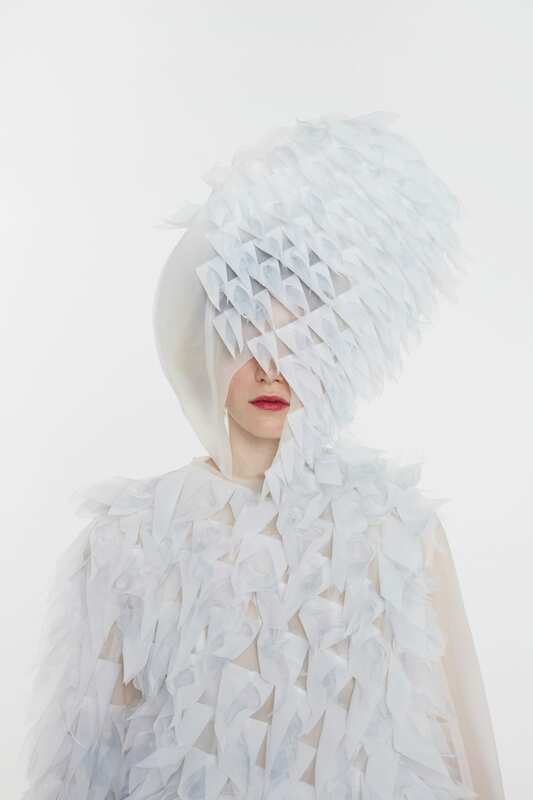 I would like these garments to open up to people that are strangers.” Once a person’s fingerprint has been read they are no longer considered a stranger and the dress will remain motionless. When still, the panels form flattened curves inspired by Spirograph patterns – yes that’s the retro geometric drawing toy that we all used to have! Sensitive to the human gaze, the garments in the collection (No)where (Now)here move when a spectator is caught staring at them. According to Gao, the project is inspired by the essay Esthétique de la disparition (The aesthetic of disappearance), by Paul Virilio (1979) and explores the concepts of attention, observation and contemplation. 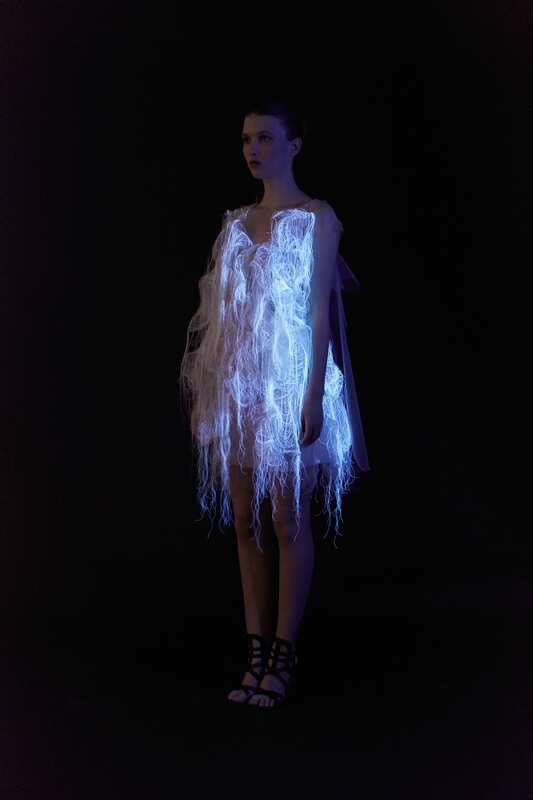 The sea creature-like dresses are made from super fine organza, photoluminescent thread, PVDF and incorporate eye-tracking electronics to trigger movement. Incertitudes project was built around the idea of uncertainty. 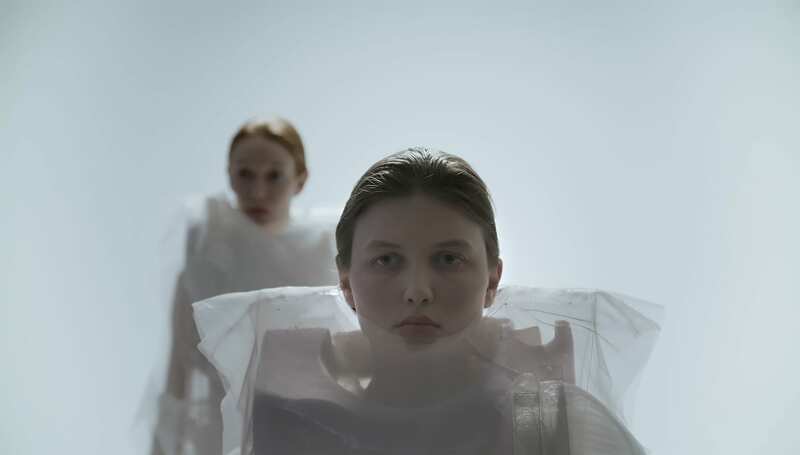 The dresses explore our modern fear of missing out and our belief that we are never in the right place at the right time. 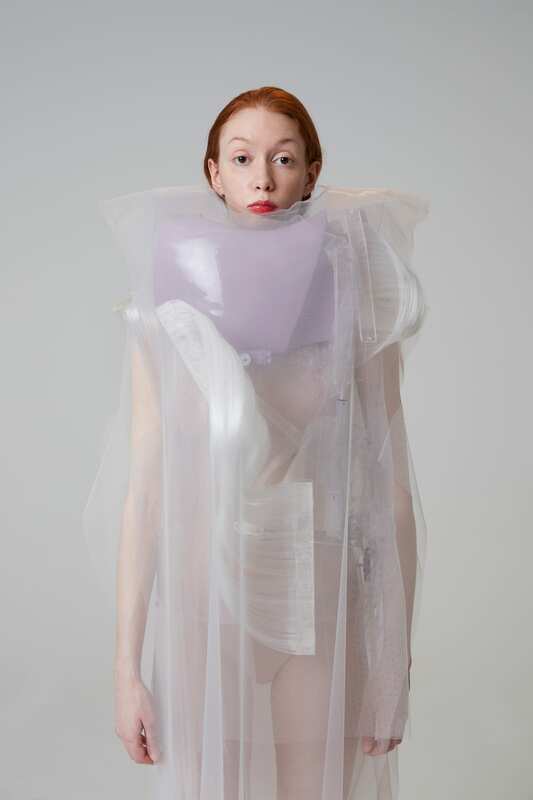 Gao contents that “a hypermodern individual is a being of the here-and-now, pressured by a logic of urgency, and worried about the future.” The kinetic garments made with PVDF plastic, dressmaker pins, and electronic devices move in reaction to the sound of a spectator’s voice. 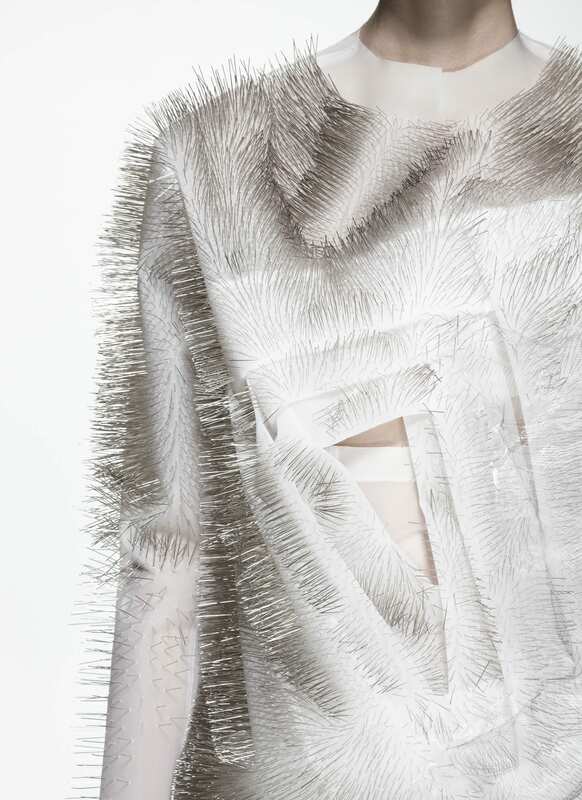 The pins that cover the dress undulate like a skin of fur; contracting and expanding in conversation with the spectator. 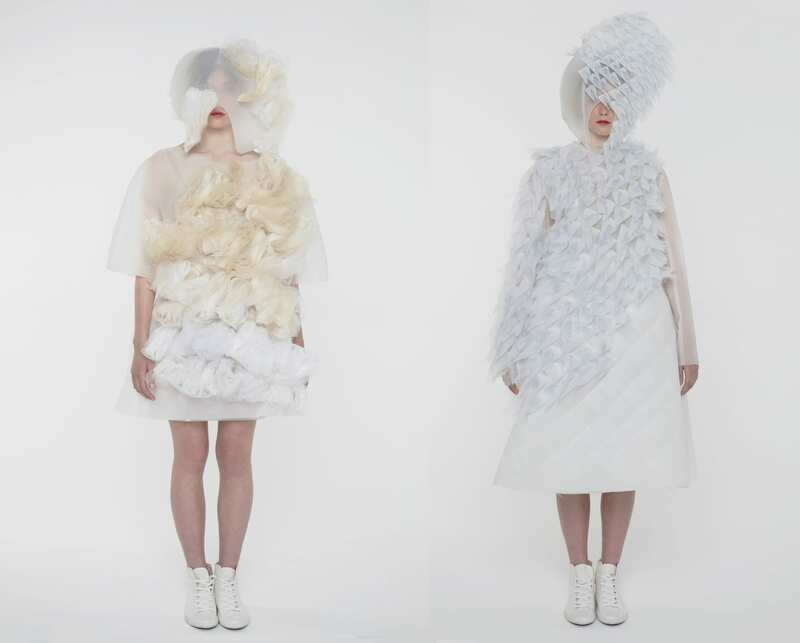 Gao’s Neutralité dresses named “Can’t” and “Won’t”, react to facial expressions using facial recognition technology. Counterintuitively, the dresses only move when the onlooker’s facial expression is neutral and stop as soon as they begin to emote. Villeneuve Residence in Montréal, Canada by Atelier Barda.